Information portal about Orange Order history and heritage in Greater Manchester, Lancashire and Cheshire. One historian of the Reformation has written: 'Wycliffe is the greatest of English reformers: he was in truth the first reformer of Christendom, and to him, under God, Britain is indebted for the honour of being the foremost in the attack upon the theocratic system of Gregory VII. If Luther and Calvin are the fathers of the Reformation, Wycliffe is the grandfather'. John Wycliffe or Wickliffe was born in the 1320s at Hipswell near Richmond, in North Yorkshire. At around the age of 16 he went to Oxford to study, becoming a fellow and then Master of Balliol College in 1361. He also became a Doctor of Theology. 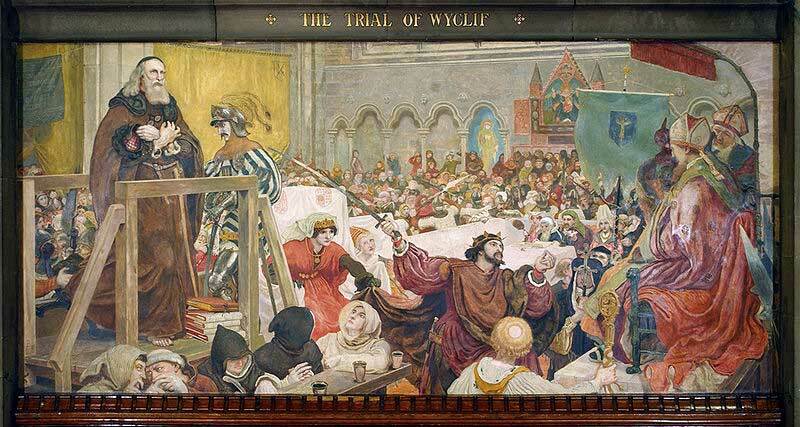 In 1366 Wycliffe came to the attention of the King, Edward III, who was refusing to pay money to the Pope. Wycliffe had written a pamphlet arguing against making the payment, which had been used in the Parliamentary debate. In 1374 Wycliffe represented the King at a meeting with Papal officers at Bruges, and in the same year he was appointed vicar of Lutterworth in Leicestershire. 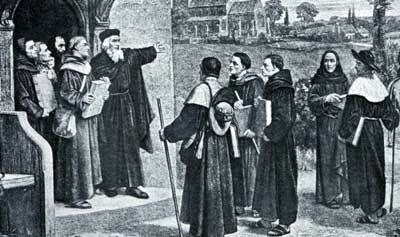 Wycliffe criticised the monks of his day for their laziness, their habit of begging, and for their perversion of religion. The worship of images and relics he called foolishness, and he denounced the sale of indulgences, masses for the dead, and processions and pilgrimages. The pope he denounced as Antichrist. The bishops of the Church of England were concerned and summoned Wycliffe to appear before them at St Paul's in 1377. He was severely criticised by his opponents but was defended by the kings son, John of Gaunt, Duke of Lancaster. The pope issued five bulls against him and condemned him on nineteen different charges taken from his writings. In 1381 Wycliffe denounced the Roman Catholic doctrine of transubstantiation, the teaching that in the Eucharist the bread and wine are changed into the actual body and blood of Christ. The King began to withdraw his support for Wycliffe and the University of Oxford was also opposed to his view. However he was so popular with the common people that he remained unmolested. Wycliffe's greatest work was the translation of the Bible into English so that people could learn the truth of God. As there were no printing presses the Scripture had to be hand written. Wycliffe's was the first English translation of the whole Bible. Wycliffe said: "Many nations have had the Bible in their own language. The Bible is the faith of the church. Though the pope and all his clerks should disappear from the face of the earth, our faith would not fail, for it is founded on Jesus alone, our Master and our God". Wycliffe's translation was based on the Latin Vulgate, and Wycliffe himself was responsible for the translation of the New Testament, his friend Nicholas of Hereford translated the Old Testament. The whole translation was revised by John Purvey in 1388. As Martin Luther's Bible translation would have great influence on the German language, so Wycliffe's, by reason of its clarity, beauty, and strength, greatly influenced the English language. Wycliffe sent out preachers throughout the country to teach people the Gospel. His followers became known as Lollards and many were martyred for their faith. Wycliffe's aim was to replace the corrupt and lazy clergy with preachers who lived in poverty, were bound by no vows, had received no formal consecration, and preached the Gospel to the people. These itinerant preachers spread the teachings of Wycliffe and reached many people in England and Scotland. Wycliffe died at Lutterworth on the last day of 1384 but the opposition and hatred of Rome could be seen from the decree of the Council of Constance 1415, forty years after his death, which ordered his bones to be dug up, burnt and scattered. 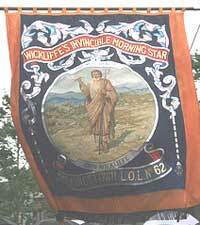 Belfast No 2 District had a Wycliffe LOL 1895, and Lower Iveagh West District in County Down has a lodge in Dollingstown, Wycliffe's Invincible Morning Star LOL 62 which has a portrait of John Wycliffe holding a Bible, 'The Word of God', on its banner. 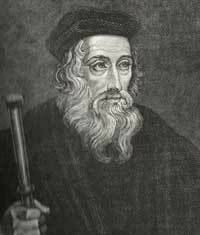 Learn more about John Wycliffe on SermonAudio.com with 12 online sermons to listen to. William Tyndale - English religious scholar, translator and martyr. This Website is Maintained by members of Loyal Orange Lodge 184 of Manchester - Est. 1876. It is our aim to share knowledge about Orange culture and heritage and to promote greater understanding of our institution to develop traditional Christian values through the Reformed Faith.